Alan Payne Insurance - A professional to meet all your personal and small business insurance needs. Design by Butterfly Consulting LLC. Database work by Butterfly Consulting LLC. Arizona Spinal Cord Association - An Association designed to enhance the lives of those with spinal cord injuries while offering support and education to family, community and professionals. 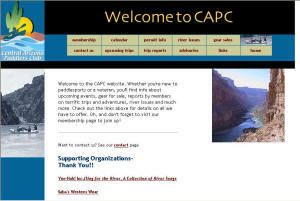 CAPC - Central Arizona Paddlers Club. A Club for Kayakers, Rafters and Canoeists. Gilbert Kiwanis - A local club dedicated to helping local Gilbert Children and through Kiwanis International, helping children Worldwide. Home Education Network of Arizona (HENA) - A statewide organization creating an environment in which all home educating families in Arizona can share resources, find support, and build community by providing Resources, Advocacy, Public Relations, Media Outreach and statewide Conference. 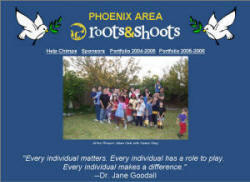 Phoenix Area Roots and Shoots - Part of an international organization, started by Jane Goodall, the Phoenix branch is made up primarily of homeschoolers, from ages 3 - 14 who work with animals, people and the environment. Use our Request A Quote page to receive more information. one month free hosting with one year of hosting paid in advance. Email included with each Plan.